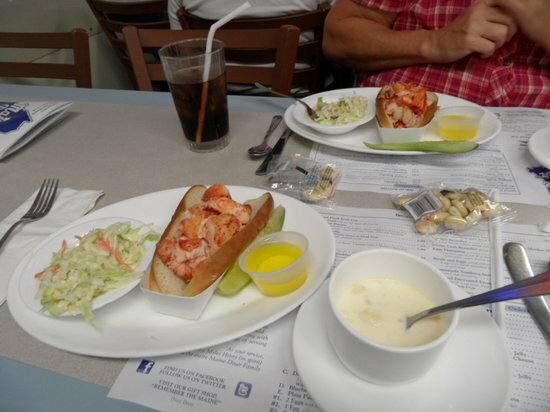 Choice of 3 soup of the day, she-crab soup, clam chowder, seafood chowder. A jumbo salad with a generous 5 oz. portion of lobster. Specify with or without mayonnaise. Served with lowfat cottage cheese. A jumbo salad with Ham, Turkey and Swiss Cheese. A jumbo salad with a combination of Tuna, Egg and Chicken Salad. Served in a French Boule, topped with cheddar cheese. Our own recipe-all white meat. Served with potato or vegetable and a corn muffin. With mushroom gravy. Served with potato, vegetable and a corn muffin. 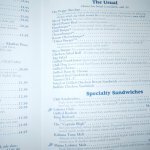 With choice of two quarter pound grilled Pearl Kountry Club Franks, grilled kielbasa or a hamburg patty. Served with coleslaw and a corn muffin. 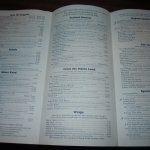 With choice of two quarter pound grilled Pearl Kountry Klub Franks, grilled kielbasa or a hamburg patty. Served with coleslaw and a corn muffin. 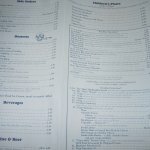 With choice of grilled kielbasa or a hamburg patty. Served with coleslaw and a corn muffin. Homemade Macaroni & Cheese with two Quarter Pound Grilled Pearl Kountry Klub Franks. Served with coleslaw and a corn muffin. Eddie, Boston's first Sports Radio Personality, loves this combination. Open faced with potato or vegetable and gravy* and a corn muffin (*mushroom gravy). Two New England style cakes (mashed potato & salt cod; formed into a patty, breaded & fried) served with coleslaw and a corn muffin. 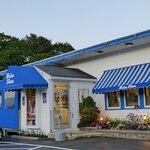 Featured in "The Cook's Magazine" May/June 1985; "Good Food, Road Food" August 1986; "Eat Your Way Across The USA"; NBC's Today Show 1997, and Food Network's Diners, Drive-Ins and Dives 2010. Our Specialty - A secret recipe that our family has passed along. Tender chunks of fresh lobster meat are topped with our own delicious crumb and then baked to perfection in a casserole dish. Fresh haddock stuffed with our own crabmeat stuffing. Fresh haddock lightly breaded and fried or baked with lemon butter & our own seasoned breadcrumbs. Four jumbo shrimp with our own crabmeat stuffing. One of our specialties. Dipped in egg wash, lightly breaded and fried to perfection - Delicious! Tender sea scallops, fried to perfection or lightly seasoned and baked. 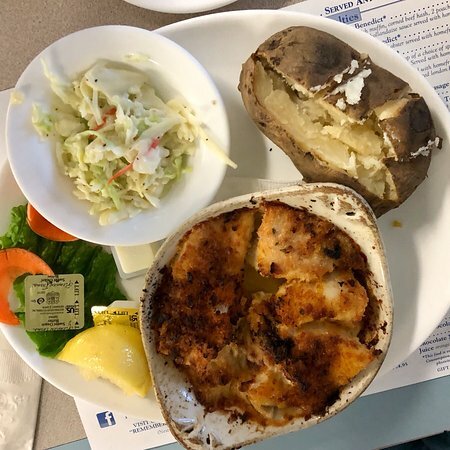 Choice of Two: Haddock, Scallops, Shrimp, Clams - add $1.00 for Clams. 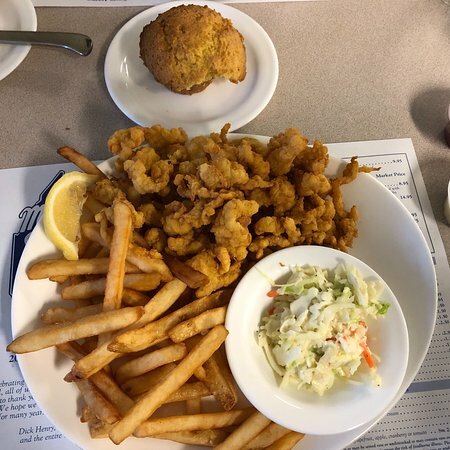 A generous portion of fried haddock, clams, scallops, gulf shrimp and a clam cake. Baked, Mashed Or Potato Salad. Regular or decaffeinated We proudly serve New England Coffee. Orange, Grapefruit, Apple, Cranberry, Tomato. Pepsi, Diet Pepsi, Ginger Ale, Sierra Mist, Root Beer and Mt. Dew. Chablis, Chardonnay, White Zinfandel, Cabernet Sauvignon. Budweiser, Bud Light, Shipyard Export Ale. A percentage of the proceeds of Light Ale sales will benefit the American Lighthouse Foundation in its efforts to restore and preserve Maine's lighthouses. 2 eggs, 2 strips of bacon, 2 sausage links, 2 blueberry pancakes with toast. 1 egg, 1 strip of bacon, 1 sausage link, 1 blueberry pancake, with toast. 2 eggs, ham, homefries, homemade baked beans, homefries & biscuit. 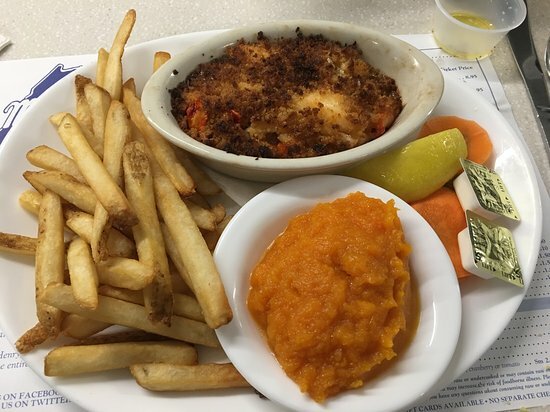 A traditional favorite, served with homefries. 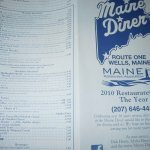 Fresh Maine Lobster, served with homefries. English Muffin topped with Corned Beef Hash, poached eggs, Hollandaise sauce and homefries. 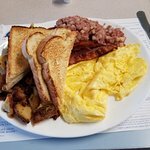 2 Poached Eggs, choice of spinach or broccoli with Hollandaise sauce, English Muffin and homefries. Served with fresh fruit or tossed salad. 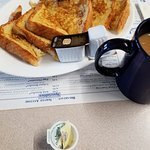 2 eggs with sliced marinated London broil available rare, medium or well done, served with homefries. An assortment of some of the Phantom Gourmet's favorite items. 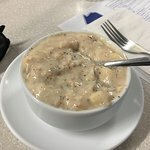 Includes a cup of our Award Winning Seafood Chowder, an 8 oz. Sirloin Steak, 2 Baked Stuffed Shrimp, 5 oz. of Baked Scallops and our homemade onion rings. Our own cooked turkey, sausage stuffing and all the trimmings - Delicious! Two skinless breasts, lightly breaded and deep fried. Two boneless, skinless breasts, marinated in a Caesar marinade and grilled. 8oz. Sirloin Steak, Char-grilled to your liking. 8oz. Sirloin steak with a choice of fried gulf shrimp, baked or fried scallops, or baked stuffed shrimp. Slow cooked seasoned pork, pulled and served with our own homemade sauce, very tasty. Marinated, thinly sliced and served with a side of mushroom gravy. 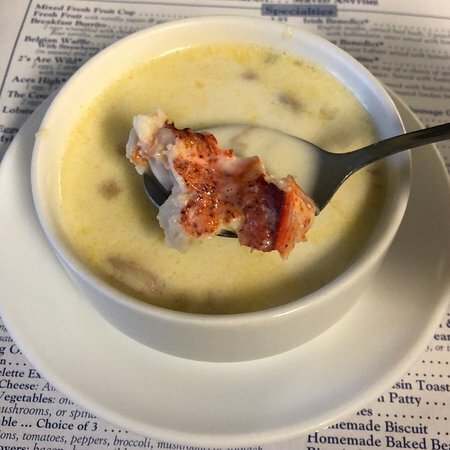 Award winning Seafood Chowder served with your choice of our famous hot or cold lobster roll. Our good friend Jim Nantz, of CBS Sports, loves this combination. Our famous Hot Lobster Roll. Lobster meat is heated and served in a grilled roll with a side of drawn butter. 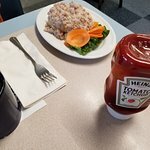 Dale, of WEEI Sports Radio in Boston, regularly orders this unique version of a Maine Lobster Roll. 等待座位约60分钟,双人预计时间然而当我把这件事告诉我们坐的东西几乎马上就送来了。 这里非常忙的一天。 晚餐我吃了汉堡和薯条 - 这真是太棒了! 这是一个英式松饼做的还有烤洋葱和辣椒 - - - 绝对的美味! 另一个家庭成员的饭吃的是鸡肉条。 玉米松饼是湿的,而且做得很好吃的蒸或新鲜蔬菜,鸡肉味非常好吃,太! 酒店的服务很好。 到处都是美味的食物。 饼图龙虾,龙虾卷热,虾龙虾俱乐部和水牛。 味道好极了! 绝对值得1/2小时的车程从oob。 还会再去! 晚餐在酒店住的时候我们去了附近的一家酒店还有一个很好的早餐和午餐。 这里的服务非常友好,高效而且非常快速! 订单都放在桌上10分钟! 分量很足,丰盛的食物! 我们肯定还会再来的时候我们住在这个地区! 我们20年前来过这里。 没有什么特别的但是氛围和服务都很棒的! 我们可能不会再去了。 过去两次给我们的主要的让人失望。 煎饼: 供应健康,面糊的老味道。 鸡蛋: 平整而且质量很差。 家常炸薯条: 前几天的。 热: 不是冷! 咖啡: 弱,但似乎有所改善了。 服务: 我简直不敢抱怨是因为他们都这么好。 我只能说这里的早餐但是我怀疑这是因为菜单上的其它食物,拜托,你怎么能乱了这? 两年前我会有一个5星级的正当!